Which of the new consoles deserves your dollar? 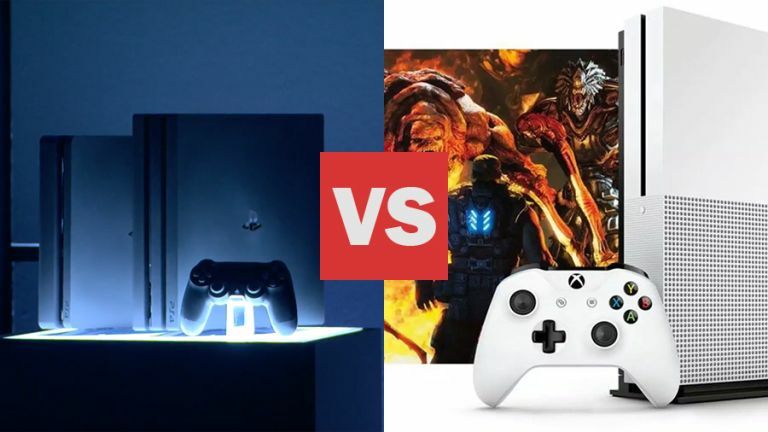 Sony's just taken the wrappers off a couple of brand new consoles and you're no doubt wondering how they stack up against Microsoft's latest Xbox One S console. Well, wonder no longer - here are the key features and specs for the PS4 Pro, PS4 Slim and Xbox One S.
Previous thought to be called the PS4 Neo, the PS4 Pro is Sony's upgraded PlayStation 4 - a PlayStation 4.5, if you like. The big news is it's got double the GPU power, which means it can drive games at 4K resolution, which should look very smart on your latest television. The size of the internal hard drive has also been upped to 1TB. Sony is keen to emphasise this is still part of the same console 'generation' though, and says it will play all existing PS4 titles. You'll also be able to transfer all your data from your vanilla PS4 onto the Pro (although this won't include certain discontinued titles such as the PT demo. Sad face). While we had plenty of doubts at the thought of a new version of PS4 halfway through its console cycle, Sony has dispelled every one of them. With the combination of 4K, 2160p resolution and HDR, PS4 Pro is more than just the most powerful games console you can buy today - it's a must for anyone with a 4K TV. On the downside, it can't play Ultra HD Blu-rays (a issue the Xbox One S certainly doesn't have), which is a shame if you wanted this as the centre of your entertainment universe. It's also a little too bulky in size, but these are small concessions considering the upgrade PS4 Pro represents. Like the Xbox One S, High Dynamic Range (HDR) support will give colours a more natural and balanced look on PS4 Pro, but if you're still a vanilla PS4 there's no need to feel left out as Sony confirmed HDR is coming to all PS4 models via a software update in the near future. Not every game has a 'PS4 Pro mode', but Sony says most games coming from here on out will support an upgraded version. This Christmas most of the big new titles will be PS4 Pro ready, including Watch Dogs 2, Call of Duty: Infinite Warfare and FIFA 17. Some existing PS4 games will be patched to support a PS4 Pro mode, including The Last of Us and Uncharted 4: A Thief's End. The PlayStation 4 Pro will cost £349 or $399 and is available now. Microsoft's new Xbox console, which has been with us for a month, is smaller, more powerful, and... whiter. As well as looking less chunky and less ugly than the Xbox One, it's also been upgraded to be capable of playing 4K video and Ultra HD Blu-rays. The other main upgrade is the option of a 2TB hard drive. In terms of games performance, though, there's only a fractional upgrade games can't run at native 4K resolution, though they can be upscaled and support High Dynamic Range (HDR) for better, deeper colours. That means the Xbox One S sits somewhere between the PS4 Pro and the PS4 Slim, with its smaller size and very slight performance upgrades. The new box measures 333mm x 276mm x 78mm and supports HDMI 2.0a output (4K video running at a 60Hz refresh rate). It's undoubtedly worth buying over the original Xbox One but lovers of Microsoft's console might want to wait for the Xbox Scorpio, due out next year - it's slated to have upgrades that are more than just superficial, and is rumoured to be even more powerful than PS4 Pro. Prices for the Xbox One S start at £249.99 or $299, and it's available now. The PlayStation 4 Slim is Sony's answer to the Xbox One S: a more compact, leaner version of the original console that keeps mostly the same hardware (just like the PS3 Slim before it). However, unlike Microsoft, Sony hasn't boosted the console's actual features this time. That means no 4K streaming or gaming support - for that you're going to have to opt for the PS4 Pro. Obviously Sony wants this to replace the original PlayStation 4, offering new console buyers the same technology inside a smaller, more aesthetically pleasing box. Indeed, in Sony's press event, it simply referred to the new box as the PS4, so this is the new baseline model it would seem. "There's never been a better time" to join the PS4 community, according to Sony's Andrew House, who introduced the console on stage. The PS4 Slim (or just plain old PS4) measures 288mm x 264mm x 39mm but for the rest of the specs you can refer to our original PlayStation 4 review. Unfortunately it sounds like Sony has ditched the optical audio out port along the way in its move to the smaller box. The PlayStation 4 Slim will cost £259 or $299 and is available now.